Ask fellow campers about "Maple Grove Resort" and nearby attractions. Very interesting and confusing Park. The services are a mishmash through the entire park, with 50 Amp service available in some (very sunny) areas, but not with sewer (except 4 spots), 30 Amp in most spots, water in all spots. Gravel roads in upper Park, but "The Woods" evidently floods each year, and looked very dusty with water, a few 30 Amp sites and no sewer. The person working at the desk on arrival was quite slow and not very helpful. Fortunately, we knew which site we wanted, as we'd been told by friends who were already there. WiFi is $1 per day per device and quality really isn't worth it. Structures are dated but adequate and clean. Landscaping is adequate, except for overhanging limbs in sites and over roads. We requested some branches be trimmed due to scraping on our 12 foot roof and awning, but they didn't get around to it. No AT&T service, but friends had T-Mobile with adequate service. We camped at Maple Grove Resort in a Fifth Wheel. Tall Timber Cafe for the ribs. Mt Adams Cafe for breakfast. Windy Ridge is 39 miles/1 hour south for great views of Mt St. Helens and Spirit Lake, with several Interpretive Centers and areas for viewing. Took my family for the weekend. Took a day trip to Mt Rainer. Park host was friendly. The pool was indoor and good size. They had changing rooms and showers. The executive golf course was fun. Greens were in good shape. Fairways were a little baked. Nice grounds to walk your dog. Some amenities could use some maintenance but overall a good place to stay. Full hook up areas are a little tight between spots but are pull through and plenty of room for you vehicle. One way through the full hook up area. If arriving after 5pm you find a spot and check in next morning. We camped at Maple Grove Resort in a Travel Trailer. Membership plus affiliation Good Sam & Coast to Coast. Older park roughly 55 full hook-up, 30 amp sites, some shade, narrow but adequate for slides and patio awning. 15 50 amp sites in full sun are not labeled as full hook-up. Roughly 80 forest sites are water only or water & electric only and are suited to smaller rigs/tent. WIFI, cable and electricity are charged on a daily basis and by device for WIFI/day. Member cost for 3 days, 30 amp, cable and 4 wifi devices was $25.00. We camped at Maple Grove Resort in a Motorhome. Several hamburger/ cafe/ restaurants close by, at least 1 pub, small supermarket within 1/4 mile. Sight seeing and nature activities main events. Mt Saint Helens volcano. Rate is ROD. This park is easy to get in and out of. The interior roads are narrow, dirt and very dusty. Sites are very close together. There are lots of annoying trees to avoid getting in and out of sites with a big rig but doable with patience. Most sites are 30 amp especially if you want FHU. It was very hot and electricity was weak keeping one air and one other thing going. Sites are level, mid-site utilities and most are fairly long. We did not use the pay Wifi but our Verizon signal was strong and usually fast. Nice indoor pool and a little golf course. Friendly, helpful staff. We camped at Maple Grove Resort in a Fifth Wheel. Little IGA grocery store and a couple cafe/restaurants close by. Getting to Maple Grove was quite easy and it's equidistant, as the crow flies, between Mt St Helens and Mt Rainier (although the road routes are more in the way of 90-120 minutes, one-way to each). The park is quite nice, with lots of trees and grass and other landscaping, very large overall with plenty of room in most sites. This is a K/M Resort park and it's primarily for resort members, but we paid a premium to stay here as non-members. They don't assign sites so you have to drive around until you find one you like. If you require 50-amp, your task will be harder because they are a scattered around the park. (The guy in the large class A that pulled in next to us had to settle for 30-amp since all the 50-amp spots were taken.) The management were fairly pleasant overall, but we had to be very firm upon checking in that we asked for, paid for and expected full-hookups; they had tried to push us into a elec/water only site. They also nickle-n-dimed you on the WiFi, requiring $1 per device, per day. And the WiFi was not very good. While it was up about 80% of the time, it was quite slow. Verizon signal was good. Our hookups were fine. They have bathroom/showers but we never went into them (they require a code, provided at check-in). The laundry was small but everything worked and was clean. While we enjoyed staying in the park overall, there were several small issues that kept us from giving it highest marks. We would likely stay there again if we were in the area. We camped at Maple Grove Resort in a Motorhome. Mt. Rainier National Park is truly gorgeous. Go early if you can, but if not, then go late (near nightfall), as the clouds seemed (to us) to congregate around the mountain during the middle of the day. Nearby Randle (walking distance) has a tiny but adequate IGA grocery store, and Big Bottom Bar had great burgers. Maple Grove is easy to find off Highway 12. It has a picturesque location in the valley south of the Mount Rainier area. This is a K/M Resorts park and has a casual feel to it. A golf course is part of the resort. We were charged as non-members. The resort pool is an indoor one and is very nice with separate showers. Resort landscaping (trees) were pleasant - some a little close for large rigs. Staff was friendly and helpful. We got extra help when having a mechanical problem with our RV. The drive east to the entrance to Mount Rainier NP on Hwy 123 is about 25 miles. We camped at Maple Grove Resort in a Motorhome. The town of Packwood, 13 miles east on Hwy 12, has restauarants, other lodging, groceries, etc. My family of seven stayed for 3 days at Maple Grove, camping with a 20' camper trailer + a tent. Included were grandma, me/wife, and 4 kids ranging from 8-21 years old. We were lucky to get a spot by the little pond, in the main area, in between the playground and the RVs parked on the side of the office and club house. Scenic, relaxing spot, with electricity and water (this spot didn't have sewage, but there are spots that have that as well). 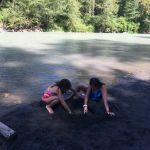 We enjoyed walking down to the river and swimming in the albeit very cold, but refreshing water. The girls loved to swim and play with the little frogs they found by the water. It was a daily ritual going to the river and a highlight of our stay. The clubhouse is big and has movies, tables and couches/chairs to relax in. There is a kitchen you can use to cook your own food if you wish. Coffee available with donation. Very good set-up. For those who golf, there's a nice well maintained course. We don't golf, so this was not an attraction for us. There's a good playground for the kids to play in. The weather was awesome (August) and we got out one day for an excursion to Mt. Rainier, at night. Got to do some star-gazing with astronomy pros who had their telescopes set up. Another highlight of our stay there. 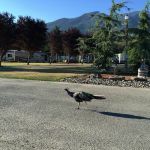 We liked the resort enough that we signed up with KM Resorts under a promo deal that gives us access to just this RV park all year. We camped at Maple Grove Resort in a Travel Trailer. My wife needed to see a doctor, and luckily, there was a walk-in clinic in Randle at 108 Kindle Rd, which took less than 5 minutes to drive to. Very handy. Foodwise, there's Mt. Adams Cafe, walking distance from the RV Park, which serves good American food and fair prices. Also, there's a good Mexican restaurant 15-20 minutes drive West called Plaza Jalisco. Great food, good prices. I also should have mentioned that you visit Mt. St. Helen's and Mt. Rainier from the RV Park -- makes for a great day trip per mountain visit. We are members, so our stay did not actually cost us anything. Definite improvement in cleanliness in the bathrooms since the last time we stayed there. The upper area of the park looked well cared for, but we prefer to stay in The Grove, which is more primitive and quiet. We camped at Maple Grove Resort in a Fifth Wheel. The Tall Timber Restaurant is about 2 miles down the road and serves a very good dinner for the price. This is a membership Park. You have to pick a spot. The site was on gravel with shade. Full hook ups with 50 amp. There are pull through, back ins, also 30 amp water & electric only. Shaded. The anemities include pool, spa, playground, pet area, rec rooms. We camped at Maple Grove Resort in a Fifth Wheel. Close by to Mt Rainer national park & Mt St Helen's. We are members, so the $2.00 was for wifi, which was very good, even in The Grove. We came in on Monday of the three day weekend after boondocking for four days. I was really looking forward to a nice, long shower. The bathhouse nearest The Grove was filthy. I thought maybe overuse from the long weekend, but the next day it was just as dirty and the dead, dry qtip was still under the bench in the shower area. Wednesday, they looked like someone had made an effort to clean, but there was dust and grime on all the top edges of the mopboards, back splashes and fixtures. I wiped some of them down with a wet paper towel as a test. While the pool and hot tub were very clean, the changing rooms were not much better than the bathhouse. Our site was nice, near the river and very quiet except for road noise (which you cannot escape due to the bridge). The Grove area does not have full service, but if you want privacy and a woodland camp spot, it is the best place on the site. There are even wooded sites near the golf course. We camped at Maple Grove Resort in a Fifth Wheel. Easy trip to Mt. Saint Helens from the campground. Cute little general store and restaurant easy walking distance from the campground. The park owns a golf course. We are K/M Resorts of America members so our camping was free. We arrived late and were told to just pick a spot. There are a lot of pull thrus. Some spots are close together while others have big grassy areas. We got lucky and have a huge grassy area that's perfect for the kids. They only have 4 campfire pits for the entire park so we had to wait for one to become available. They are $5 a day. A bit of a pain but they do have community fire area. hosts are very friendly and helpful. Pool is indoor and large which is perfect for rainy days. Very close to Mt Rainer Natl Park and Mt St Helens. Lots of fun hiking surround this park. There is a restaurant and high priced grocery nearby.Overall, pleased with this campground. We will be back! We camped at Maple Grove Resort in a Travel Trailer. Nightly Rate reflects ROD. ($0) If you like signs with posted rules, this is your place, they are plastered everywhere! We tried the Tengonet Wifi service for one day to see how well it worked. It only connected to one of our 4 devices, and was so slow that it was virtually impossible to do anything on the internet. There are very few 50 amp sites with full hookups. 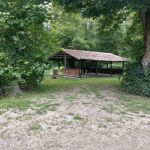 The campground is very quiet, clean and well maintained. The office personnel were very courteous. We camped at Maple Grove Resort in a Motorhome. The bath houses have been recently refurbished and are in excellent condition. Several children's activities have also been added. The (lower, older) Maple Grove campsites' roads have recently been re-graveled and some of the sites refurbished. If children's activities, golf, and an in-door pool are important to you, this could be an excellent choice. We prefer staying in the "grove" as it's more a camping experience. In the week we've been here this year there have been been more then 5 campers, with spots for over 100. The lower area offers only water or water/power(30 amp) spots only (due to winter flooding issues). Some of the upper area sites have water/power/sewer/TV. We have stayed here before and would again. Due to our membership class, our actual cost is $0. We camped at Maple Grove Resort in a Fifth Wheel. Beautiful clean resort. Great clubhouse, lush grounds. Only a short drive north to Puget Sound towns from this resort. Will definitely stay again. We camped at Maple Grove Resort in a Motorhome. Nice campground in a small town. No AT&T and friendly staff. Small sites but quit accessible. 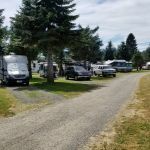 As a Coast to Coast member I reserved a site with full hookups, but when I got there I was told that I could not have full hookups, only water and 50 amp. Couldn't figure that one out. We camped at Maple Grove Resort in a Motorhome. My wife needed to see a doctor, and luckily, there was a walk-in clinic in Randle at 108 Kindle Rd, which took less than 5 minutes to drive to. Very handy. Foodwise, there's Mt. Adams Cafe, walking distance from the RV Park, which serves good American food and fair prices. Also, there's a good Mexican restaurant 15-20 minutes drive West called Plaza Jalisco. Great food, good prices. I also should have mentioned that you visit Mt. St. Helen's and Mt. Rainier from the RV Park -- makes for a great day trip per mountain visit. Are you affiliated with Maple Grove Resort ?